Best known for his acting, Ted Danson has been campaigning for cleaner oceans since the 1980s. 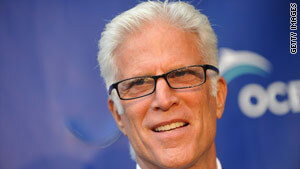 (CNN) -- Actor, activist and environmentalist, Ted Danson isn't afraid to tackle any number of roles. Perhaps best known for his part as likeable barman Sam Malone in "Cheers" for 12 years, he more recently recast himself as an unscrupulous billionaire in "Damages." But away from his on-screen heroes and villains, Ted's most enduring real-life role has been as a committed environmentalist working to conserve the oceans. Optimistic and engaging, Danson is a board member of Oceana, a group committed to ocean and marine-life protection, that he helped establish in 1987. Last year he appeared before the U.S. Congress to urge the moratorium on offshore drilling for oil to be reinstated. His personal environmental epiphany came in the 1980s when had to explain to his daughter that she could not swim in the sea because the water was too polluted. It presented him with some tough questions on the state of the environment, which he responded to by taking action. As well as spearheading campaigns for Oceana and lending his voice to narrate the 2009 documentary film "The End of the Line," he's in the process of co-authoring a book on ocean conservation. "For over 20 years, I've been watching this issue grow and build in the public consciousness and I am convinced that we're now at a tipping point," he said. "The rise in awareness of, and fight against, climate change has convinced me that people are ready for a book that brings to light the critical issues regarding the future of our oceans." From overfishing and acidification of the seas and being a big fish in Hollywood send in your questions for Ted and join the conversation. Use the "Sound off" box at the bottom of this page for your questions. We'll use the best questions in the live broadcast here on CNN.com.